The interactive installation and web application On Broadway represents life in the 21st-century city through a compilation of images and data covering the 13 miles of Broadway that span Manhattan. The result is a new type of city view, created from the activities and media shared by hundreds of thousands of people. On Broadway installation is currently on view in New York Public Library as part of the exhibition Public Eye: 175 Years of Sharing Photography. The exhibition will be opened until January 3, 2016. The installation uses a 46-inch multi-touch monitor. Feature article in journal's special issue ‘Landscape Architecture under Big Data’, Landscape Architecture Frontiers Journal (China), forthcoming Fall 2015. Interview with Lev Manovich, SPACE Magazine (South Korea), June 2015. From sepia to selfies. 175 years of photography, CBS News, May 2015. NYC is a city that does sleep, a bit, Revolution Analytics blog, March 2015. Exploring a City through Social Media Snapshots, PSFK.com, March 2015. 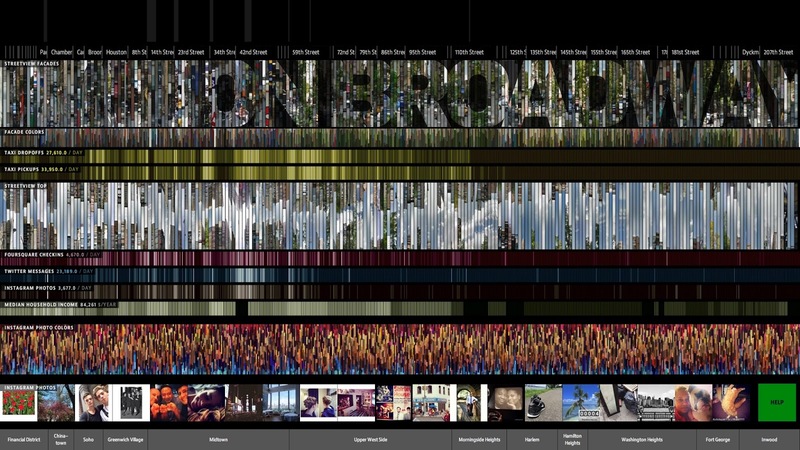 Big Data Turns Broadway into an Interactive Art Project, VideoEdge, March 2015. Coverage of "On Broadway" in Living in the Digital Age video program, Deutsche Welle (Germany), March 2015. On Broadway, Dragonweb (Hungary), March 2015. Broadway the Digital Way, The Info Monkey blog, March 2015. 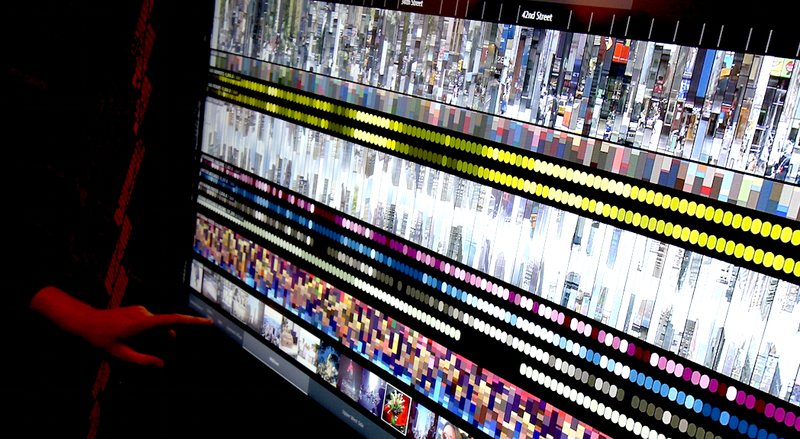 On Broadway, An Interactive Installation Featuring Layers of Images and Data Gathered along Broadway in Manhattan, The Laughing Squid, March 2015. Data visualisatie brengt drukste straat NYC tot leven ("Data visualization brings the busiest street in NYC to life"), Numrush.nl (Netherlands), March 2015. 'On Broadway' Is a Stunning, Data-Driven Portrait of Life in New York City, The Creators Project, March 2015. On Broadway shows city life through data cross-sections, FlowingData, March 2015. Take A Stroll Down Broadway Through Hundreds Of Thousands Of Instagram Images, Fast Co.Exist, March 2015. Visualizing Life Along Broadway, Center for Data Innovation, March 2015. 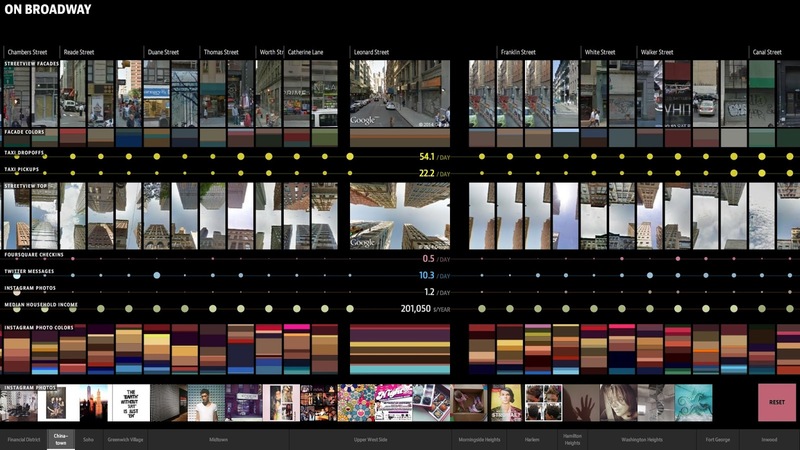 Massive Data Visualization Brings NYC's Busiest Street To Life, Fast Co.Design, March 2015. A Digital Collage of Broadway Made From Strips of Data, CityLab (The Atlantic), March 2015. Public Eye: 175 Years of Sharing Photography, The New Yorker, February 2015. A febre da ‘selfie’ pelo mundo, Globo News TV, Sem Fronteiras (Brazil), February 2015. Includes coverage of On Broadway installation at NYPL and a long interview with Lev Manovich. Aired on Globo TV, largest media channel in Brazil. selected economic indicators for the parts of NYC from US Census Bureau (2013). Daniel Goddemeyer, Moritz Stefaner, Dominikus Baur, Lev Manovich. PhD students at The Graduate Center, City University of New York (CUNY): Agustin Indaco (Economics), Michelle Morales (Computational Linguistics), Emanuel Moss (Anthropology), Alise Tifentale (Art History). Today companies, government agencies and other organizations collect massive data about the cities. This data is used in many ways invisible to us. At the same time, many cities make available some of their datasets and sponsor hackathons to encourage creation of useful apps using this data. Our project is supportive of the ideas to give citizens back their data, but it takes a unique approach to this goal. Using ‘On Broadway’ interactive interface, citizens can navigate their city made from hundreds of millions of data points and social media images they have shared. How we can best represent a "data city"? We did not want to show the data in a conventional way as graphs and numbers. We also did not want to use another convention of showing spatial data – a map. The result of our explorations is "On Broadway": a visually rich image-centric interface, where numbers play only a secondary role, and no maps are used. The project proposes a new visual metaphor for thinking about the city: a vertical stack of image and data layers. There are 13 such layers in the project, all aligned to locations along Broadway. Using our unique interface (available as the online application and as a version for a large interactive multi-touch screen, currently installed at New York Public Library), you can see all data at once, or zoom and follow Broadway block by block. Project updates and new research using the datasets we assembled for On Broadway will be published here as blog posts and as articles in academic journals.